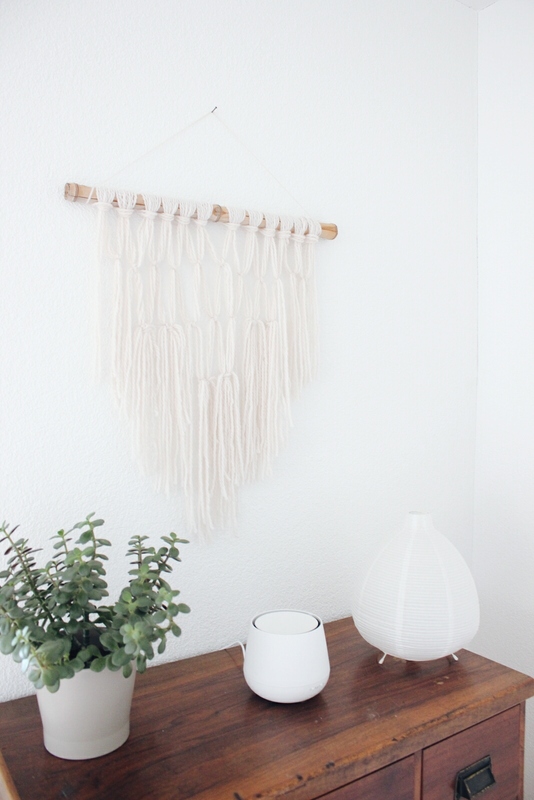 I love putting my own creativity into our home decor and I have been wanting to create a macrame for this one corner of our living room for quite a while now. But honestly, I thought it was going to be super complicated, a lot of work, and most of all expensive. So I went looking for an idiot-proof DIY tutorial on YouTube that even I could follow and I found it in Amanda Rach Lee’s video. 1. First things first, invest in some organic eco-friendly yarn! Most commercial yarns are treated with chemicals such as acid, bleach, dye, mothproofing and fire retardant. Doesn’t sound like a material you want to work with or hang in your green home. Organic and eco friendly yarn is not dyed but instead retains the natural shade of the sheeps wool. You can read about the differences in yarns here. For a list of eco friendly organic yarn or vegan options like hemp yarn go here. 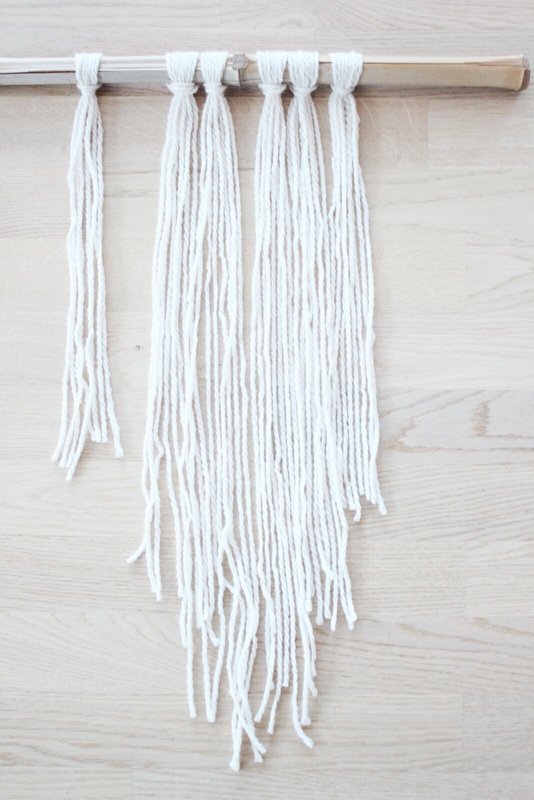 I chose a bulkier, off white organic yarn for $7 that is easy to work with and creates a very relaxed look. That look is harder to create if you use a thinner yarn. 2. Find a rod/stick/branch you love! 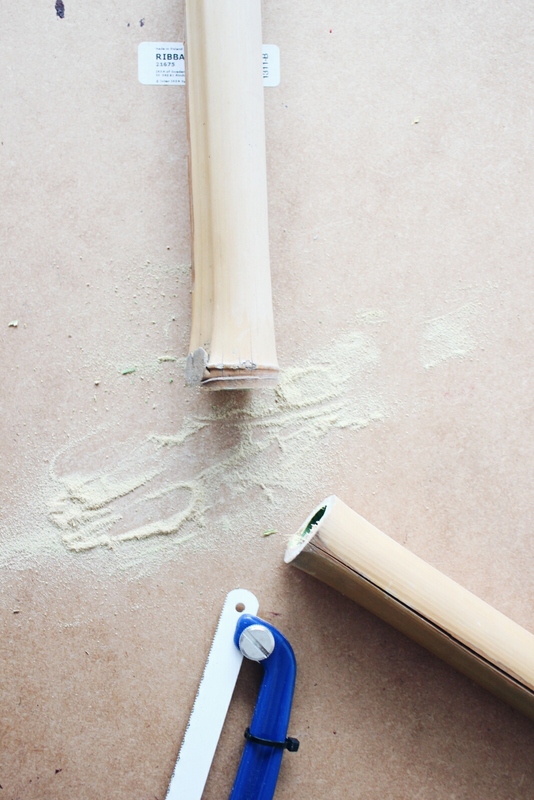 I had a bunch of bamboo sticks from an outdoor decoration that I kept for a potential diy project down the line. 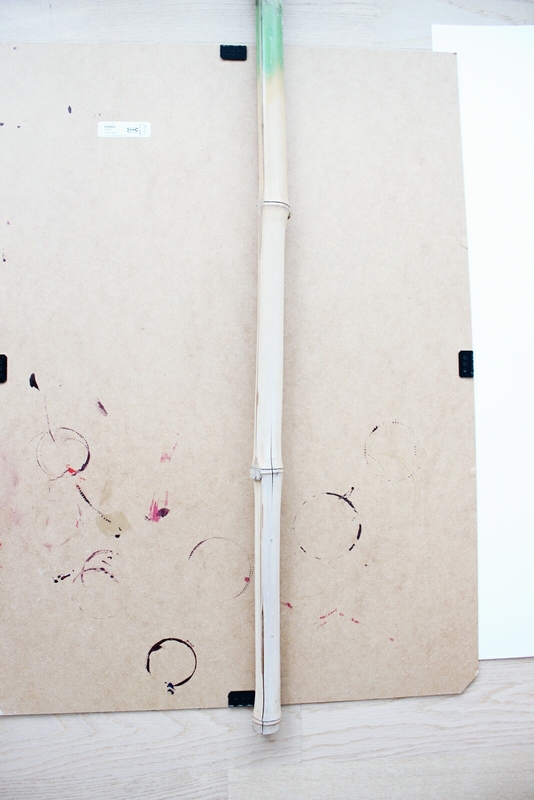 I sawed the stick in half so that it was about 53 cm in length (20 inches). Bamboo sticks are quite thick and give any wall hanging a more relaxed look. I really didn’t want it to look too neat, which will be the case if you use a straight rod. I suggest you go find yourself a nice stick/branch in the woods, that will give it a more natural look. 3. I followed the tutorial for the first part, but chose to cut my yarn pieces in different lengths so that it creates a triangle shape from the outer corners moving in. I cut a total of 12 sets of pieces, with 8 pieces each (96 pieces total), 6 sets for each side of the stick. 4. Then I followed her technique of making double knots from the outside in, just kind of deciding what I liked as I went. 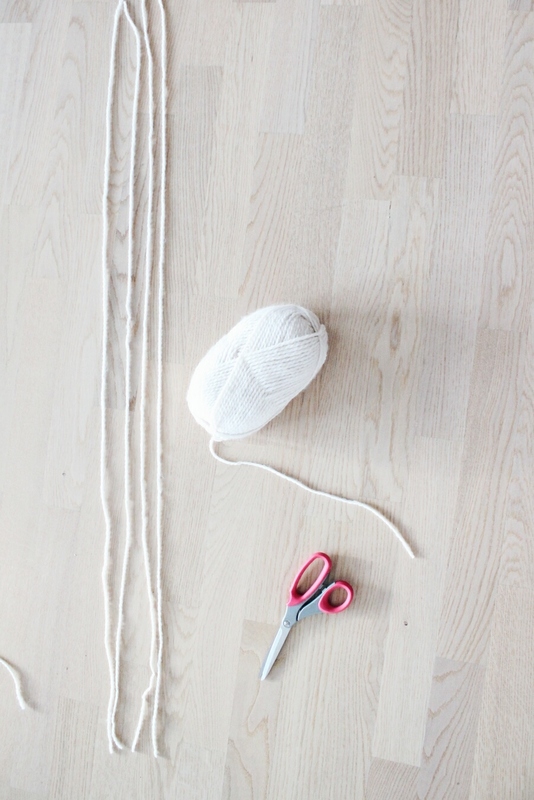 The good thing about using a thicker yarn is that you can very easily untie the knots and play around with styles! 5. Once I was finished knotting, I decided to cut some more pieces to add to some of the middle knots. I just added them in, using the same easy knot as used to tie them to the stick. 6. If you like the look of it, you can then simply use a piece of yarn to tie the stick on both ends and hang it using a nail. I opted for a piece of the same yarn instead of jute yarn to hang my wall hanging. 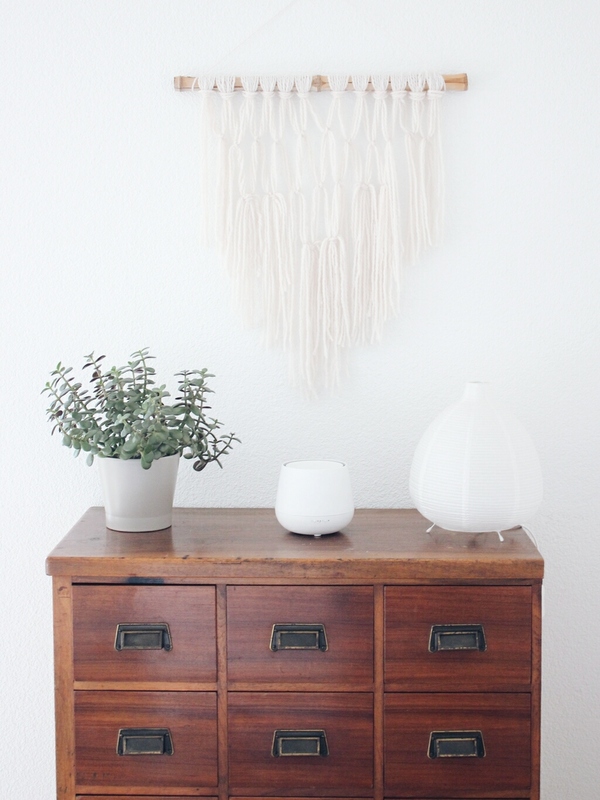 I hope you enjoyed this macrame DIY tutorial for dummies! I love how natural looking it turned out, using sustainable materials, repurposing something I already owned and creating something truly unique for our living room with very little time, effort and money. 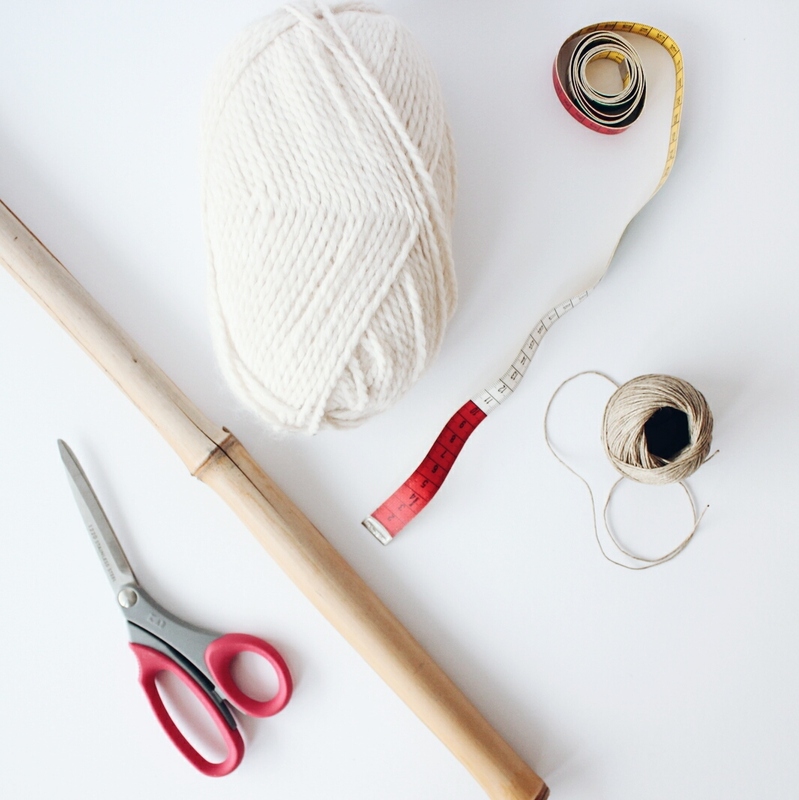 Tag your creations using #macramefordummies and have fun with it!